The Invisible project is the first work by Agata Witkowska set in urban space. Using unconventional means, the artists populates empty buildings located in the very city centre. Figures behind the window are but shadows of men, reflections on a glassy surface. Basing on a routine observation, Witkowska created an outline of a project concept. The most inspiring moments were those in which the author herself fell in a state of stagnation or, while performing mindless and mechanical activities, she was ‘out of her body’, absent. She combines the living matter – a man – with a carrier, which allows to show extrabodily absence through imitation. The Invisible are virtual inhabitants, standing in windows of empty rooms. ‘People behind a window pane’ are portrayed during the ritual activities or natural movements they make when lost in thought. Their faces are absent, indifferent to the world around them. Focused on their internal voice, as if listening, lost in contemplation over some issues or invisible events, they freeze in an absent gesture. Their gaze rests in nothingness and eternity, but due to spatial restrictions it cannot avoid meeting the gaze of the neighbour opposite, or maybe his reflection lost in thought. Sometimes, it may even seem that the virtual inhabitants look at us, but their eyes do not see, only stare into emptiness. Just as the title suggests, by hiding in our apartments, we become invisible, anonymous. Covered by a pane of glass, we disappear among the reflections of the visible. 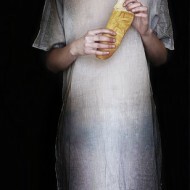 In 2010, Agata Witkowska graduated from the Faculty of Multimedia Communication at the Academy of Fine Arts in Poznań. She completed her diploma project under the supervision of professor Piotr Chojnacki. She continues her education at the Academy of Fine Arts in Poznań. She has received a City of Szczecin scholarship (2010). 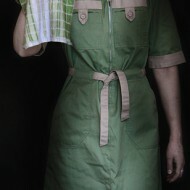 Her series Wyobcowanie took part in a collective exhibition at Polish Culture Centre in Vilnius in September and November 2010. In March 2011, Agata Witkowska took part in a group exhibition at the ‘13 Muz’ Municipal Gallery of Art. Agata Witkowska is the under constant influence of analogue photography, which has been her favourite since the beginning of her career. Meetings with such artists as Mirosław Bałka, Piotr Kurka or Izabella Gustowska have developed her creative consciousness. Her artistic development is also influenced by collaboration with people organising International Festival of Visual Arts inSPIRACJE.